Malaysia's Prime Minister Mahathir Mohamad has said the High-Speed Rail (HSR) link between Kuala Lumpur and Singapore is "postponed", and not scrapped. Tun Dr Mahathir, in Japan on his first trip abroad since his Pakatan Harapan pact won the general election last month, told Nikkei Asian Review on Monday that the HSR was temporarily shelved due to its high costs. He reiterated at a press briefing in Tokyo for Malaysian media yesterday that his new administration needs to study the multibillion-dollar rail project. "In a way, it's postponed. At this moment, we need to re-study and, if we are short of funds, we can delay the implementation of the project or reduce the scope of project," he said. His comments come less than two weeks after Malaysia announced that it was axing the RM72 billion (S$24.3 billion) HSR project as it moved into austerity mode and sought to slash its RM1 trillion federal debt. Dr Mahathir had said then that the HSR and other mega projects signed off by the previous administration would be revisited once Malaysia's finances improved. In his interview with Nikkei, Dr Mahathir acknowledged the need for high-speed rail in the future but said Malaysia "cannot afford it at this moment". "We cannot say we will never have high-speed rail in Malaysia," he told the Japanese publication. The HSR deal was signed by Malaysia and Singapore in December 2016, with the 350km link scheduled to begin services in December 2026. It would cut travel time between Singapore and Kuala Lumpur to 90 minutes, from four hours by car currently. The line was to have eight stations, with one in Singapore's Jurong East. Singapore's Transport Minister Khaw Boon Wan, in a statement on June 1, said the Republic has "requested the Malaysian government through diplomatic channels to clarify Malaysia's position on the project". Mr Khaw said should Malaysia cancel the project, Singapore will study the implications and exercise its rights - including any right to compensation for expenses - in accordance with the terms of the bilateral agreement signed in 2016. Malaysia had earlier indicated that there was a RM500 million compensation payment to be made if the deal was cancelled. Mr Khaw, who is also Coordinating Minister for Infrastructure, added: "Singapore continues to support the HSR project and to fulfil all its obligations under the agreement." Malaysia has said that Dr Mahathir will personally handle negotiations with Singapore, and that it was not completely shutting the door on the rail link. Dr Mahathir met Japanese Prime Minister Shinzo Abe yesterday, and said Malaysia had sought yen credit from the Japanese government as part of measures to resolve its debt problem. Japan has agreed to study Malaysia's request for the soft loan, said Dr Mahathir, but said that the amount was not discussed. Malaysia and Japan also agreed to keep the Strait of Malacca and the South China Sea free for navigation for all countries. "Japan is willing to cooperate with any country to support this concept with Malaysia. I am resolved to further strengthening cooperation conducive for regional peace and stability, including in the maritime safety area," Mr Abe said at a joint press conference with Dr Mahathir. After the event, Mr Abe presented Dr Mahathir with a Japan World Cup team jersey printed with Dr Mahathir's name and the number 7 to show he is Malaysia's seventh prime minister. Dr Mahathir presented Abe with a book on himself, and said it would enable Mr Abe to know him better. Malaysia wants to scrap the Kuala Lumpur-to-Singapore high-speed rail (HSR) but will consult with Singapore about the move, Prime Minister Mahathir Mohamad said yesterday. He said there could be a penalty of 500 million for cancelling the project, but he was unsure if this was in ringgit or Singapore dollars. "It is a final decision (to scrap it) but it will take time because we have an agreement with Singapore. We have to manage it at the least cost possible," Tun Dr Mahathir said at a press conference, when asked about the project. He said he had not seen the agreement but was told "the compensation may be as much as 500 million". The Pakatan Harapan (PH) government which won the May 9 general election said it is reviewing all mega projects after discovering that the ousted Barisan Nasional (BN) had racked up debts of RM1.1 trillion (S$371 billion). Asked for a response, a spokesman for Singapore's Ministry of Transport said: "Singapore has not yet received any official notification from Malaysia. "We had agreed to proceed with the HSR project based on mutual benefits and obligations set out in the HSR bilateral agreement. We will wait for official communication from Malaysia." One Malaysian official told The Straits Times that the HSR is "95 per cent dead" but implications of dumping the project could be prohibitive. 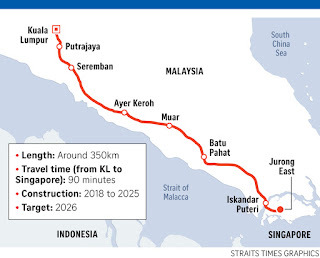 Inked by the previous Najib Razak administration, the 350km line is estimated to cost upwards of RM50 billion, and will slash the travelling time between Singapore and Kuala Lumpur to 90 minutes when completed in 2026. Most of the line - 335km of it - will be in Malaysia, with the remaining 15km in Singapore. A top Malaysian government source told The Straits Times that exact legal details of the project need to be examined by PH leaders, who moved into government offices only a week ago. "Economic Affairs Minister Azmin Ali will be tasked to negotiate with Singaporean counterparts," the source said, referring to the role played by the previous administration's economic planning minister Abdul Rahman Dahlan, who was lead minister for the HSR. Finance Ministry officers have scheduled meetings to find out the full extent of the HSR agreement inked with Singapore in December 2016, and it is likely that compensation will surge once major tenders are awarded. Another rail project on the chopping block is the East Coast Rail Link (ECRL) financed by a RM55 billion loan from China's Exim Bank, with a reported RM13 billion already drawn down. It is unclear at this stage how much can be recouped as the funds have gone directly to China Communications Construction, which was appointed the contractor without any open tender. However, Malaysia Rail Link, which owns the project, already has RM14.5 billion of government-guaranteed debt on its books. Dr Mahathir told the Financial Times in an interview published yesterday: "We need to do away with some of the unnecessary projects, for example the high-speed rail, which is going to cost us RM110 billion and will not earn us a single cent. That will be dropped." Datuk Seri Azmin told reporters on Sunday that "Letters of Acceptance for some parts of this project have not been issued... but if there is a contractual agreement then of course there will be financial implications". He added: "That is why we must discuss with Singapore on how to review this project." PUTRAJAYA • Malaysian Prime Minister Mahathir Mohamad said yesterday that the Cabinet has agreed to scrap the Kuala Lumpur-Singapore high-speed rail (HSR) project due to high financial costs, subject to discussions with the Singapore Government. When asked why the project, which he said would cost RM110 billion (S$37 billion), was called off, Tun Dr Mahathir said: "The most important thing for us now is to reduce the amount of borrowings by the government. If this country is to avoid bankruptcy, we must learn how to manage our big debts. So, one of the ways, of course, is to do away with projects that are not beneficial to the country," he said. When asked if the HSR and other mega projects would be revisited once Malaysia's finances are better, Tun Dr Mahathir said: "Definitely." He added that there will be a more detailed briefing today on what the government is doing to ensure the borrowings can be handled and spending reduced. The new government has been grappling with slashing expenditure, amid revelations that ousted premier Najib Razak's administration racked up a debt of RM1 trillion. Datuk Seri Najib yesterday debunked the cost of the HSR stated by Dr Mahathir, and said the Malaysia-Singapore joint committee, until the beginning of this year, had projected that the cost of the project is about RM72 billion, including the acquisition of land paid to Malaysians. Dr Mahathir said earlier this week that Malaysia may have to pay RM500 million in compensation for scrapping the HSR deal. The service, targeted to begin by Dec 31, 2026, will cut travel time between Singapore and Kuala Lumpur to 90 minutes. The government is also cancelling a third line for the Klang Valley Mass Rapid Transit project, estimated at RM40 billion. Another project, the East Coast Rail Link, is still being reviewed. It links Kuala Lumpur and Kota Baru, and is to be financed by a RM55 billion loan from China's Exim Bank. KUALA LUMPUR - Prime Minister Mahathir Mohamad said on Tuesday (May 29) that Singapore will be informed about Malaysia's wish to scrap the high-speed rail (HSR) project. He also said that he stood by earlier comments that the project would cost a total of RM110 billion (S$37.2 billion), after a former Malaysian minister who was in charge of the project said on Tuesday that estimates had put the cost at RM50 billion to RM70 billion. Tun Dr Mahathir was met by reporters at a breaking-of-fast event in Kuala Lumpur on Tuesday. He had told the media on Monday that the HSR would be scrapped as the new government seeks to trim its RM1 trillion debts. Asked on Tuesday whether Singapore had been informed, he replied: "No, I made a statement with the press (on Monday), but they will be informed." 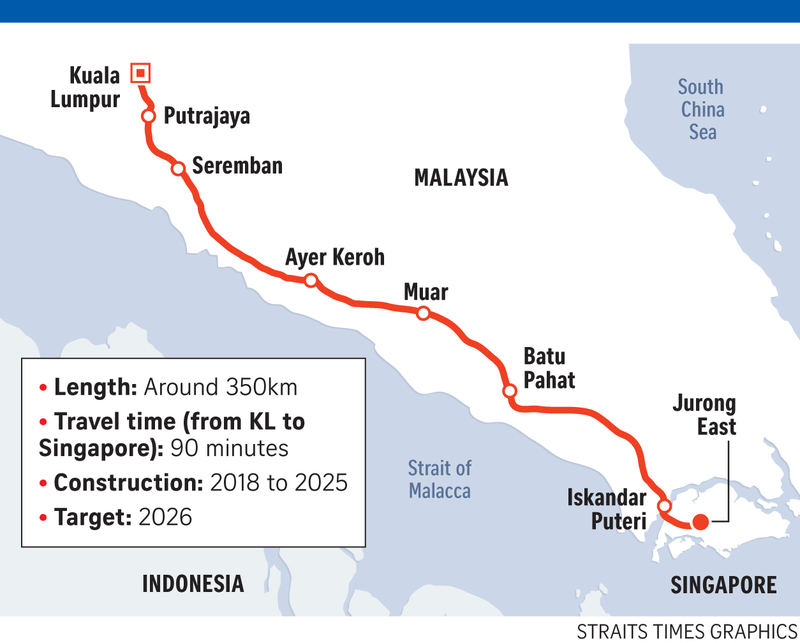 The HSR deal, inked by the previous administration in December 2016, would see the 350km line slash travelling time between Singapore and Kuala Lumpur to 90 minutes when completed in 2026. Most of the line - 335km of it - would be in Malaysia, with 15km in Singapore. There would be eight stations - seven in Malaysia and one in Jurong East. Asked for a response on Monday about Malaysia's move, a spokesman for Singapore's Ministry of Transport said: "Singapore has not yet received any official notification from Malaysia. We had agreed to proceed with the HSR project based on mutual benefits and obligations set out in the HSR bilateral agreement. "We will wait for official communication from Malaysia." Datuk Seri Abdul Rahman Dahlan, who was the minister overseeing the HSR in the previous administration under Datuk Seri Najib Razak, in a statement disputed the RM110 billion project cost mentioned by Dr Mahathir. "The Pakatan Harapan government says the HSR's RM110 billion price tag is the main reason the project must be cancelled. How did they arrive at this figure? This differs greatly from the range of RM50 billion to RM70 billion that the governments of Singapore and Malaysia had budgeted earlier this year," he wrote. Dr Mahathir said in response: "When we said the country's debt is at RM1 trillion, we have the documents to back it. He's (Rahman) saying the estimated cost is between RM50 billion and RM70 billion. So show us the proof... we have the papers (documents)." Mr Abdul Rahman, who was minister in the Prime Minister's Department (Economic Planning Unit), in his statement said cancelling the project is a "short-sighted" move by the new government. Dr Mahathir said on Monday that Malaysia might have to pay a penalty of 500 million for cancelling the project, but he was unsure if this was in ringgit or Singapore dollars. At the 8th Singapore-Malaysia Leaders' Retreat in January this year between Prime Minister Lee Hsien Loong and then Prime Minister Najib, they were asked how the two countries would ensure projects such as the HSR will be unaffected by political changes, as these projects could span several terms of government. PM Lee said then that there is a "binding agreement" that must be abided by "whoever is the government on either side". "If the subsequent government has other ideas, well, that would have to be dealt with and the agreement will deal with these contingencies. But I have no doubt on Singapore's side, we have every intention of implementing what we signed and committed to today," Mr Lee added. The development of the Jurong Lake District may be adversely affected, now that the Singapore-Kuala Lumpur High-Speed Rail (HSR) is unlikely to happen, say observers. Malaysia's Prime Minister Mahathir Mohamad said yesterday that Malaysia is pulling out of the HSR deal with Singapore. He had labelled it an "unnecessary project" which would cost "RM110 billion (S$37 billion) and will not earn us a single cent". His position echoed comments he made to The Straits Times in March, prior to the Malaysian general election, when he said the HSR was "a little bit premature". "What we need is the present rail to be improved. If you can do 180kmh, that's good enough, because the distance is very short," he said. "It's not like China or Japan even. There you take three hours despite high-speed train. But here, Singapore to Kuala Lumpur, well, it's almost about half an hour. So, well it's a good thing to come later on but I think at this moment I would rather straighten the lines, increase the speed and that should be sufficient for us." Malaysia is liable to pay Singapore a compensation for not fulfilling the agreement signed in 2016 by the government under Datuk Seri Najib Razak, Tun Dr Mahathir's predecessor. Planning work had already begun on Singapore's end. For example, Singapore's Land Transport Authority had called for tenders for the design and construction of tunnels and associated facilities for Singapore's end of the HSR last month, with construction expected to start next year. But experts told The Straits Times that the Republic could lose more than just man-hours. 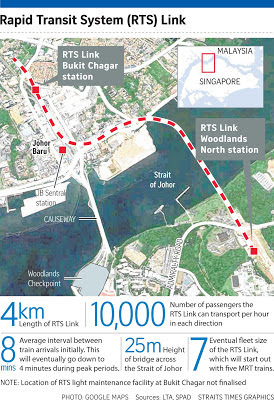 Last year, the Urban Redevelopment Authority (URA) unveiled plans to turn the Jurong Lake District - where the terminus for the HSR was to have been sited - into Singapore's second Central Business District. "There are other development plans for the area, but the HSR terminus would have been the jewel in the crown," said National University of Singapore transport lecturer Lee Der-Horng. He noted that the 67ha site of Jurong Country Club - acquired in 2015 for the development of the terminus - would be left vacant, adding that a "careful review" of what to do with the land was needed to ensure it gels with plans for the district. International Property Advisor chief executive Ku Swee Yong felt the loss of the terminus could easily set back the development of the Jurong Lake District by several years. "The development of the area was dependent on the fruition of the HSR," he said. Mr Ku added that the absence of the rail connection will make the district less attractive to businesses as well as Malaysians who could have used the HSR to commute into Singapore to work. The URA masterplan had hoped to count on both the HSR terminus and Tuas mega port to help create 100,000 new jobs, which could come from sectors like maritime, infrastructure and technology. Jurong is also close to many manufacturing industries and businesses, and two of Singapore's main universities - Nanyang Technological University and the National University Singapore. Singapore University of Social Sciences Associate Professor Park Byung Joon, however, felt the actual impact of the loss of the HSR may be minimal, noting Singapore and Malaysia are already well connected by land and air. He added that high speed railways are generally unsuitable for carrying freight, which would mitigate the economic impact. "The HSR is built for passengers, not freight," he said. Dr Mustafa Izzuddin, fellow at ISEAS - Yusof Ishak Institute, said that while the impending scrapping of the HSR project may be unfortunate, it was to be expected as the Pakatan Harapan government is making good on its campaign promise to manage the country's finances and cut federal spending. "While this signals an inauspicious start to new Malaysia-Singapore relations, it does not automatically mean that there is a reversal in tide towards adversarial diplomacy," he said. "The Pakatan Harapan government has made this decision for domestic reasons, and not because it harbours any hostility towards Singapore." Malaysians who commute to Singapore daily hope the plan to build a cross-border MRT line will stay on track under the new government led by Prime Minister Mahathir Mohamad. They say the Rapid Transit System (RTS) Link, a 4km line connecting Bukit Chagar station in Johor Baru to Woodlands North, will make travel more convenient and faster. About 400,000 Malaysians work and live in Singapore, with most of them making the daily commute from Johor and returning in the evening. Diploma student Tenmohli Tanggaiya, 20, who takes the public bus to school at PSB Academy near Raffles Place, said she wakes up at 4am to avoid the traffic jam at the Causeway. She added: "If I can take the train, then maybe I can have a little more sleep." The RTS Link was agreed between the two countries under the previous Barisan Nasional (BN) government. Following BN's defeat by the Pakatan Harapan pact on May 9, the new administration is reviewing all "mega-projects" to reduce government debts. Speaking to Singapore reporters yesterday, new Johor Menteri Besar Osman Sapian said he has yet to receive word from the federal government on whether the RTS Link would go ahead. Still, Malaysians interviewed by The Straits Times hope the proposed project will not be derailed. Johor resident and sales executive Wong Yong Keong, 28, said that travelling between Johor Baru and Singapore can take about three hours during peak periods, and that he wishes for the project to start as soon as possible. The deal was inked in January, and rail operators SMRT and Prasarana Malaysia were expected to form a joint venture next month. Construction of the line was expected to begin next year and it is set to open by Dec 31, 2024. Singapore Institute of Management undergraduate Joseph Chandra Pillay, 26, said he lives with his brother in Singapore to avoid the traffic congestion during weekdays but returns to Johor Baru to visit his parents on weekends. "The whole Causeway is jammed and nothing is moving," he said. "You'll see all kinds of people walking across the Causeway. You'll see students coming in, you'll see people wearing office attire. You'll see normal people," he added. But some are indifferent to the project. Mr Amirul Ashraf, 26, and his three Malaysian friends said they prefer riding to their office at Seletar Aerospace Park. However, he suggested developing a bridge linking JB's industrial town of Pasir Gudang to Punggol, which is close to where they work. He said: "Why we choose (to ride) the bike is because it is more comfortable and suitable for us." Malaysia will go ahead with plans to build a cross-border MRT line between Johor Baru and Singapore, but wants to look at ways to lower costs, said new Transport Minister Anthony Loke. The government has agreed to continue with the Rapid Transit System (RTS) Link, a 4km line that will connect Bukit Chagar station in JB to Woodlands North, he told reporters after a Cabinet meeting yesterday. "Of course, we will review the agreements. We want to review the terms and conditions, and the Finance Ministry will look into how to reduce the cost of the project," said Mr Loke. "But we are committed to continue with the project." Since it swept into power in the May 9 polls, the new Pakatan Harapan government has set its sights on slashing expenditure to reduce the hefty RM1 trillion (S$336.4 billion) national debt accumulated by the administration of former premier Najib Razak. Among other things, it has taken aim at expensive mega ventures such as the Kuala Lumpur-Singapore high-speed rail project, which the new prime minister, Tun Dr Mahathir Mohamad, has said will cost Malaysia RM110 billion. He has indicated that the project will be scrapped subject to discussions with the Singapore Government. Mr Loke told Channel NewsAsia on Wednesday that while Malaysia will have to re-examine the much smaller RTS project, including its cost, the link is "still on the table". "I was made to understand that the cost of the project is RM4 billion for the Malaysian government but, of course, we are looking at how to reduce cost... We have just made the decision; we have to initiate negotiations and discussions with our counterparts in Singapore," he told the broadcaster. The rail agreement was inked in January between Singapore and Malaysia under the previous Barisan Nasional government. Rail operators SMRT and Prasarana Malaysia were expected to form a joint venture next month, and construction was slated to begin next year. Leaders on both sides of the Causeway had previously hailed the RTS, which is set to open by end-2024, as playing an important role in boosting the cross-border economy between Johor and Singapore, and easing commutes. About 400,000 Malaysians work and live in Singapore, and many make the daily journey back and forth from Johor. Just last month, Singapore Transport Minister Khaw Boon Wan, who visited the sites at the Woodlands station and Bukit Chagar station, said works for the link were on track for completion. "We are bullish about the upcoming RTS Link, linking Woodlands North Station to Bukit Chagar Station in JB," he wrote on Facebook. "When completed in 2024, it should be the preferred mode of transport for commuters crossing the Johor Strait." Mr Khaw said the trip between the two stations takes just five minutes, and would "significantly cut down the Causeway jams". Former Johor menteri besar Mohamed Khaled Nordin said in January that the link would benefit not just Johor residents, but also those from other states seeking employment in Singapore. And Singapore citizens, he added, may travel more easily to Johor for shopping and recreation, boosting the economy. Malaysia's decision to scrap the Kuala Lumpur-Singapore high-speed rail (HSR) project will come as a disappointment to those who saw it as emblematic of closer transport links between the two countries. The futuristic HSR deal, signed by the previous Malaysian government in December 2016, would have seen the 350km line reduce travelling time between the two cities to 90 minutes when completed in 2026. Most of the line - 335km of it - would have been in Malaysia, with 15km in Singapore. The HSR had been described by political leaders as a "game changer" in that it would have benefited both countries by enhancing the infrastructure for economic growth and job opportunities. Unfortunately, this forward-looking plan has now been derailed. Links by road and air are strong, but faster rail travel would have helped to alleviate some of the inconvenience caused to travellers by jams at the Causeway and Second Link or the time spent on the ground to make a short flight by air. Indeed, the rail project could also have a been a cornerstone of Asean's efforts to improve connectivity, one of the key challenges which the region needs to meet to move to higher forms of economic cooperation. These fundamental reasons for the HSR have not changed. What has changed is the economic and political backdrop. The new Malaysian government decided to call off the HSR as part of a review of all mega projects in an effort to cut the debts chalked up by the previous administration. Malaysian Prime Minister Mahathir Mohamad has explained that the " most important thing for us now is to reduce the amount of borrowings by the government. If this country is to avoid bankruptcy, we must learn how to manage our big debts". Lamentable as it is from a bilateral point of view, the Malaysian decision is understandable given the parlous state of its finances. Tun Dr Mahathir has also said the project could be revisited when Malaysia's finances improve. In March, he had described the HSR as being "a little bit premature" and said Malaysia would rather straighten the existing railway lines and increase the speed of trains. This suggests that improving the transport infrastructure remains a possibility although the HSR, in the form envisaged, will not materialise. The HSR agreement is a binding bilateral one which stipulates a penalty for breaches by either side. This is only appropriate since the scrapping of the high-speed rail will disrupt Singapore's plans, including to turn the Jurong Lake District, where the HSR terminus would have been sited, into a second Central Business District. Just as they might understand Malaysians' need for financial stringency at this point, Singaporeans would expect similar consideration of their economic interests. Finance Minister Lim Guan Eng has accused his predecessor Najib Razak of ignoring interest charges when claiming that the high-speed rail (HSR) to Singapore would cost only RM72 billion (S$24.5 billion). The Mahathir Mohamad administration has said it will ask Singapore to cancel the 350km link to Kuala Lumpur - the first major project to be scrapped by the three-week old government - as it would have cost a total of RM110 billion (S$37 billion). Former premier Datuk Seri Najib, who was also finance minister, in a Facebook post on Wednesday, said the cost of the project as of early this year stood at RM72 billion. Mr Lim told reporters on Thursday (May 31): "No, it is more (than RM72 billion) if you include the interest component. Please be truthful. It is way above RM100 billion." Mr Najib, who has been writing on his Facebook account to question various issues involving the new Pakatan Harapan government, said studies showed the HSR would create many jobs. "There would have been 110,000 job opportunities created, which is estimated to increase to about 442,000 by year 2069," he wrote. Asked about this after an event on Wednesday, Prime Minister Mahathir told reporters the project could have cost anywhere between RM60 billion and RM100 billion. "You want to spend RM60 billion to RM100 billion so that 100,000 people can work. That's not very efficient," he said. Malaysia is due to open negotiations with Singapore to unwind an agreement inked in 2016 by the previous administration. The HSR line would have cut travel time between the two capitals to 90 minutes once completed in 2026, from about four hours by car. Mr Lim, meanwhile, said the 197ha Bandar Malaysia project, which was to house the KL terminus for the HSR, is being reviewed. It was owned by troubled state investor 1MDB before the land was returned to the Finance Ministry. It would also have seen two Mass Rapid Transit (MRT) lines stopping in the township, helping push its projected gross development value to RM200 billion. But one of the MRT networks, Line 3, has now been shelved as the Pakatan Harapan government reviews its finances. BEIJING • Malaysia's scrapping of a planned high-speed rail link with Singapore would probably damage the interests of China and other economic partners, a state-backed Chinese tabloid said on Thursday. Companies that were eyeing contracts to build and operate the project were reportedly from China, Japan, South Korea, Europe, Singapore and Malaysia. And now, all their efforts may be in vain, Global Times said in its column, Eye On The Economy. To cut down on its expenditure, Malaysian Prime Minister Mahathir Mohamad had announced that the government would cancel the Kuala Lumpur-Singapore High Speed Rail (HSR) project, which reportedly would cost RM110 billion (S$37 billion). Malaysia and Singapore officially agreed in 2013 to build the HSR link by 2020. Following the announcement to ditch the plan, Tun Dr Mahathir said his government is also renegotiating with China a rail deal aimed at connecting the South China Sea at the Thai border in the east with the strategic shipping routes of the Malacca Strait in the west, according to Reuters. The Global Times said if Dr Mahathir wants to review big projects agreed to by his predecessor, the affected firms "have the right to claim compensation". "The Chinese government will... safeguard the interests and rights of Chinese enterprises," the tabloid said. "If Malaysia's new government fails to adhere to the spirit of the contract, it has to pay the price for its error." It also said Malaysia is not the only investment destination for foreign infrastructure businesses. "It is very easy for Chinese companies to shift their focus to other countries, but Malaysia's economy is the one that will suffer big losses." It added that uncertain economic policies driven by political factors "are a reason why some developing countries have failed to achieve an economic take-off". "We believe Malaysia will handle the problem properly. Sino-Malaysia friendship is time-tested," said the Global Times, adding that Malaysia is a key point along the routes of China's Belt and Road Initiative. "Chinese investors will continue to look closely at Malaysia's economic situation in search of opportunities for cooperation." KUALA LUMPUR • Malaysian Prime Minister Mahathir Mohamad denied yesterday that he pre-empted the Cabinet when announcing the cancellation of the High-Speed Rail (HSR) line between Singapore and Kuala Lumpur. "No, that was decided by the party from the very beginning," Tun Dr Mahathir told a news conference when asked if he had pre-empted the other Cabinet ministers, pointing out that his Pakatan Harapan coalition had campaigned on the issue during the general elections last month. "We campaigned on that issue. I am not going to go away from the decision of the party simply because I could not form the Cabinet soon enough," he said. He also assured investors that Malaysia would remain business-friendly and treat all firms fairly. "We cannot be afraid of inconsistencies because we have been in the government for only three weeks. So, you can't assess us as being inconsistent. We want to be consistent. We will be very business-friendly," he said, when asked what the government would do to protect the interests of foreign investors. "Local or foreign, all will be treated in the same way. If they have any problems, we will attend to those problems," he said, adding that the law would protect the rights of investors. He vowed to correct any mistakes made by the previous Barisan Nasional government. "We can't continue with their mistakes. It will be corrected, but we will go according to the agreement or the contract that has been given," he said. "Only when something wrong is done with the contract, then we will take action." After taking power, Dr Mahathir announced the cancellation of several mega projects, including the HSR, and introduced a slew of spending cuts as part of efforts to reduce the national debt of RM1 trillion (S$335 billion). The Mahathir administration has said that the cost of building the HSR, at RM110 billion, was prohibitive considering Malaysia's current financial standing, while former prime minister Najib Razak claimed it would have cost only RM72 billion, and that its economic benefits would far outweigh the estimated price tag. 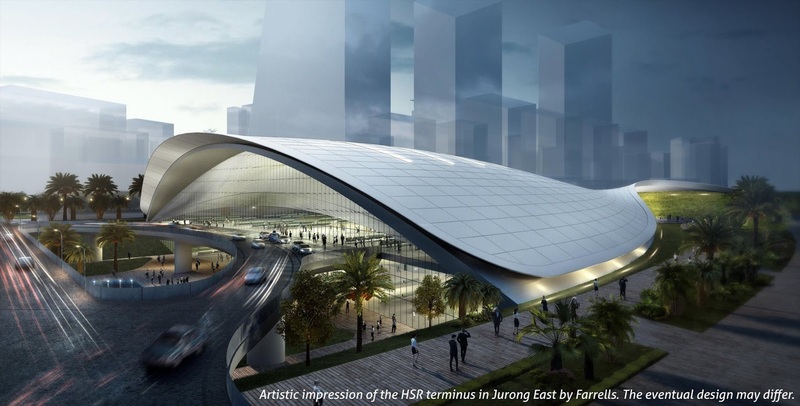 The Singapore Government said yesterday that it is continuing to incur costs on the High-Speed Rail (HSR) project while it awaits clarification from Malaysia regarding its intention to scrap the HSR. Meanwhile, Malaysia said Prime Minister Mahathir Mohamad will personally handle negotiations with Singapore, and that it is not completely shutting the door on the proposed 350km link. Transport Minister Khaw Boon Wan, in a statement yesterday, said that Singapore has "requested the Malaysian government through diplomatic channels to clarify Malaysia's position on the project". The Republic has also informed Malaysia that Singapore "is continuing to incur costs", he said, but did not elaborate on what these costs involve. Several contracts have been awarded for the HSR project. For example, in February last year, the Land Transport Authority awarded a $24.6 million contract to Aecom Singapore to conduct an advanced engineering study for the Singapore stretch of the HSR link. Mr Khaw said yesterday, should Malaysia cancel the project, Singapore will study the implications and exercise its rights - including any right to compensation for expenses - in accordance with the terms of a bilateral agreement signed in 2016. "Singapore continues to support the HSR project and to fulfil all its obligations under the agreement," added Mr Khaw, who is also Coordinating Minister for Infrastructure. He said that when Malaysia proposed the HSR project to Singapore in 2013, the Republic agreed because it was convinced of the benefits to Singapore. "We still believe that a high-speed rail link between Singapore and Kuala Lumpur would be in our mutual interest, economically as well as in terms of the friendship and mutual understanding of our two peoples," Mr Khaw noted. The rail link was expected to cut travel time between the two cities from four hours by car currently to 90 minutes when completed in 2026. The line was to have eight stations: the Jurong East station in Singapore, and on the Malaysian side, Bandar Malaysia, Sepang-Putrajaya, Seremban, Melaka, Muar, Batu Pahat and Iskandar Puteri stations. Malaysia said yesterday that it is open to dusting off the HSR project once its RM1.1 trillion (S$369 billion) in debt is eased and at "terms which are favourable to us". Finance Minister Lim Guan Eng said that "we just cannot afford" the current cost of the HSR , which the new Malaysian administration said has a RM110 billion price tag. "Terminating for now doesn't mean it cannot be revisited in the future," he said in a briefing with foreign media. "We understand the sensitivity that cancelling these projects has caused to neighbouring countries, but this is a choice we are compelled to make in order to restructure our debts to make sure we do not mortgage the future of our children." The Malaysian government revealed last week that its total liabilities were now RM1.1 trillion, far higher than the RM686 billion claimed by the ousted Najib Razak administration. "We may revisit it, but of course, we want to ensure the financial architecture of this project is fair to Malaysia, and of course, we want to strike the best deal," Mr Lim said. He said Tun Dr Mahathir would be personally handling "the necessary negotiations with Singapore" because of "the traditional close relations" and the Prime Minister's "close ties with Singapore leaders". He added that the RM110 billion price tag for the HSR was a "conservative" figure as the cost of RM72 billion estimated by the previous government did not include the interest component. "Following media reports that Malaysia has decided to terminate the HSR, Singapore has requested the Malaysian government through diplomatic channels to clarify Malaysia's position on the project. We have informed the Malaysian government that Singapore is continuing to incur costs on this project as it awaits Malaysia's clarification, and that in the event Malaysia terminates the project, Singapore will study the implications and exercise our rights (including any right to compensation for expenses incurred) in accordance with the terms of the HSR bilateral agreement. When Malaysia proposed the HSR project to Singapore in 2013, Singapore agreed because we were convinced of the benefits of the project to Singapore. We still believe that a high-speed rail link between Singapore and Kuala Lumpur would be in our mutual interest, economically as well as in terms of the friendship and mutual understanding of our two peoples. Singapore continues to support the HSR project and to fulfil all its obligations under the agreement. However, it is only tenable to continue the project if Malaysia likewise supports it, and is willing to fulfil its end of the agreement. Singapore looks forward to being informed of Malaysia's position on the matter." When the High-Speed Rail (HSR) project was first proposed by Malaysia at the 2013 annual leaders' retreat in Singapore, both sides hailed it as a "game changer". "It will transform the way people interact, the intensity of our cooperation and the degree to which we become interdependent on one another and therefore have stakes in each other's success," said Prime Minister Lee Hsien Loong then. "This is huge, this is big, this is a real game changer," Malaysia's then Prime Minister Najib Razak said. But now, the Cabinet of new Malaysian Prime Minister Mahathir Mohamad has said that the project has been shelved. When Datuk Seri Najib became Prime Minister in 2009, talk of a KL-Singapore high-speed rail link gathered pace. It was described as a high-impact project in Malaysia's Economic Transformation Programme in 2010 - a cornerstone of Mr Najib's administration. It stated that the HSR project was expected to add 28,700 jobs and contribute RM6.2 billion to Malaysia's gross domestic product. The HSR could help alleviate the roughly 9.2 million yearly trips between Kuala Lumpur and Singapore in 2010, of which 68 per cent were by road, said the Malaysian authorities then. By 2010, Malaysia and Singapore had also resolved the longstanding issue of the KTM land in Singapore, paving the way for both countries to agree on the HSR joint venture in 2013. This marked the first commitment by the two nations to construct the railway by 2020. No estimates of the project cost were given. 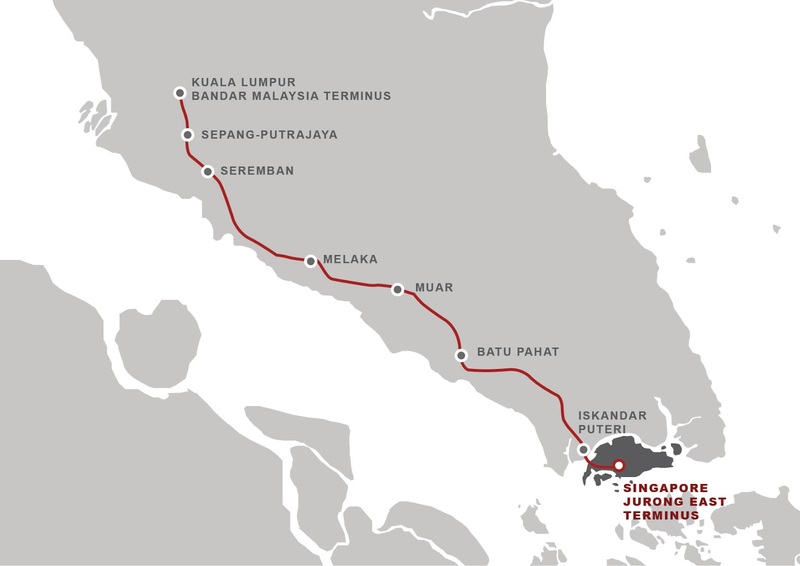 Before the Najib administration, there were several proposals for a fast rail link between Singapore and Malaysia that did not take off. Tun Dr Mahathir, then Malaysia's Prime Minister, floated the idea of a fast electric train service at the 1995 Asean Summit, to form a Pan-Asia rail link from Singapore to Kunming. The plan was to enhance and electrify the existing KTM tracks, which already terminated in Singapore, to speed up Malaysia's national rail network. Singapore had also accepted the offer then. A similar project was put forward by then Prime Minister Abdullah Ahmad Badawi who took over from 2003, but high costs were an issue and the plan was shelved in 2005. Meanwhile, Malaysian conglomerates and developers such as Renong Berhad and YTL Group had submitted separate proposals to the government for a high-speed rail that ran on non-KTM tracks. YTL's RM$8 billion proposal in 2006 called for new tracks to be laid. A separate RM16.5 billion proposal involved magnetic levitation trains, due to be built by this year. These projects were also dropped due to feasibility and cost issues. WHAT HELPED CLINCH THE HSR? Transport Minister Khaw Boon Wan on Friday said that Singapore agreed to the HSR project because it would benefit Singapore. "We still believe that a high-speed rail link between Singapore and Kuala Lumpur would be in our mutual interest, economically as well as in terms of the friendship and mutual understanding of our two peoples," said Mr Khaw. Indeed, when it was mooted, both Mr Lee and Mr Najib said it would dramatically raise connectivity, enhance business linkages and bring the peoples of Malaysia and Singapore closer together. While Malaysia was expected to pay most of the cost - 335km of the 350km railway was to run through the peninsula - it was also set to reap the lion's share of the benefits as the HSR would stop at several Malaysian cities along the way. A World Bank study had estimated it would add RM21 billion (S$7 billion) to Malaysia's coffers and create 111,000 jobs. S. Rajaratnam School of International Studies visiting senior fellow Tomoo Kikuchi tells Insight that the HSR would have made possible the type of urban cluster seen in other global cities, such as Tokyo and New York. Dr Kikuchi, who specialises in international economics, says: "Politically, it symbolises the will to integrate the two economies." Singapore University of Social Sciences senior lecturer and transport economist Walter Theseira notes that having this scale helps create a large labour force pool, justifies more economic specialisation, and facilitates knowledge transfer between the two nations. "Singapore and KL needed to remain competitive in a future where larger cities are often more productive than smaller ones, and the HSR was one way of helping achieve that," he adds. Both sides continued talks on key issues, such as the location of the stations, the alignment of the rail line, and the project's financing and management. Jurong was named as the location for the Singapore terminus in 2014, and the Government acquired the land occupied by Jurong Country Club for the HSR. Raffles Country Club was to follow suit next month. The project also attracted proposals from Chinese, Japanese, French, German and American companies. In 2015, Mr Lee and Mr Najib agreed to push back the project's completion date, which was later set at 2026. The initial 2020 deadline proved to be too challenging due to the project's complexity. The landmark moment was finally reached in 2016, when both nations inked a memorandum of understanding to build the line and a legally binding bilateral agreement. Hailing it as a significant milestone, Mr Lee said: "I look forward to taking my first train ride up to Putrajaya in 10 years' time." Construction was to start next year, but even as tenders were being awarded to companies on both sides earlier this year, along came the watershed 14th Malaysian General Election. The rest is history. Datuk Seri Abdul Rahman Dahlan, who led the HSR project as Minister in the Prime Minister's Office under Mr Najib, has called the subsequent move to shelve the HSR a "short-sighted" one. Mr Najib said on Facebook last Wednesday that he hopes "decisions will not be made while clouded by emotions, as only the people will lose out in the end". Meanwhile, Mr Khaw said on Friday that Singapore has "requested the Malaysian government through diplomatic channels to clarify Malaysia's position on the project".